Today, I’m sharing a delicious on-the-go fruit snack for kids, brought to you by Horizon Organic. Back to school is around the corner! You know what that means: back to the homework and lunch box preparation. It also means back to extra-curricular activities, play dates with friends and shorter days overall. It’s a time of “go, go, go!” Which means your meals and snacks will also need to be on-the-go. You know what I’m talking about: those days when you have ballet rehearsal at 5.30 and when you get home at 4.45. Yes we need to eat in 30 minutes! This doesn’t mean your meals and snacks can’t be healthy! With some creativity and help from the kids, we can have a delicious on the go meal and an after-class fruit snack for kids in less than 30 minutes. The key to accomplishing this everyday miracle is being ready and getting the kids involved. First you need a plan. I usually plan 3 to 4 meals per week and shop accordingly. Having the ingredients on hand (and not stopping to the grocery store to shop) will reduce cooking preparation considerably. I usually involve my kids in this important aspect: what do you want this week and I get nice suggestions. Besides, they are more eager to eat when they play a role in choosing. Then assign tasks according to their age group. My 13 year –old usually sets up the table. It speeds up the meal preparation and he feels important by doing so. Besides he learns some etiquette skills: which side to put fork, etc. Those skills helped him score a part time job at his school. My 6 year old loves mixing flour and eggs if we are making crepes. She is learning numbers so she loves using the measuring cups. I try to inolve them in the process and supervise their work. If it needs a knife or a more adult skill, I take over. Let them customize the go to meal or snack: If you hare having a sandwhich night, let them prepare it on their own. I usually put the ingredients on the table and each one customizes his or her sandwich. I make sure they add veggies to it. Use shapes, cutters, and other kid friendly cooking tools: One of the challenges of cooking with the kids is the tools: you cannot use a long sharp knife or a sharp cookie cutter. You can buy kid friendly kitchen tools at any Dollar Store or cooking store. For example, my daughter has her own apron and cookie cutter. When she prepares her sandwich she uses her heart shaped cookie cutter. She loves getting creative with her food and she is enticed by it. 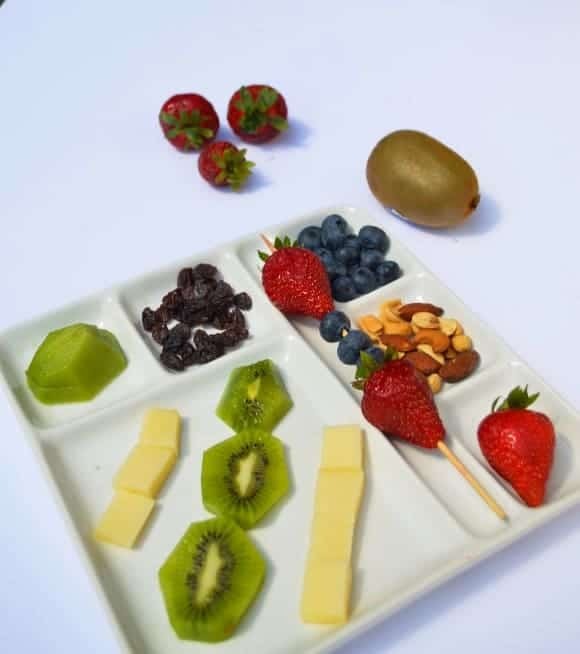 Now, for an delicious on-the-go snack, how about the following snack plate? It is ready in less than 15 minutes and is perfect for an after school snack for kids! 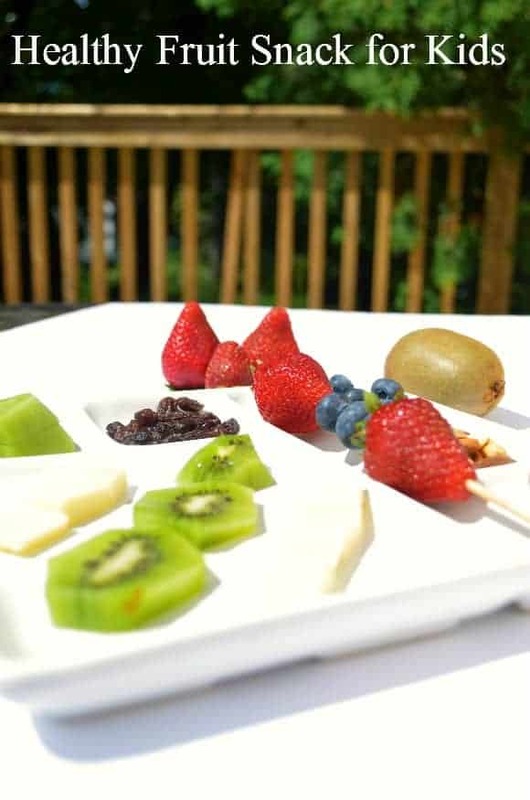 Making this fruit snack for kids is as easy as sliding the larger ingredients onto the skewers and adding the smaller on the side. My daughter had a blast preparing the skewer and eating them. 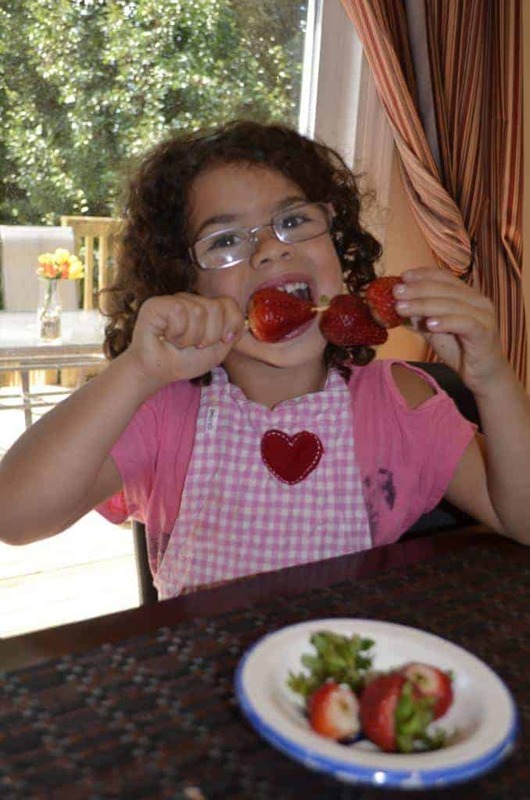 She removed the green stem of the strawberry and put it in the skewer. I wanted to add some blueberries but I did not have the chance too because she ate them! She sliced the cheese and I peeled and sliced the kiwi. Add some delicious, Horizon Organic milk on the side and you have a perfect on-the-go snack for kids! 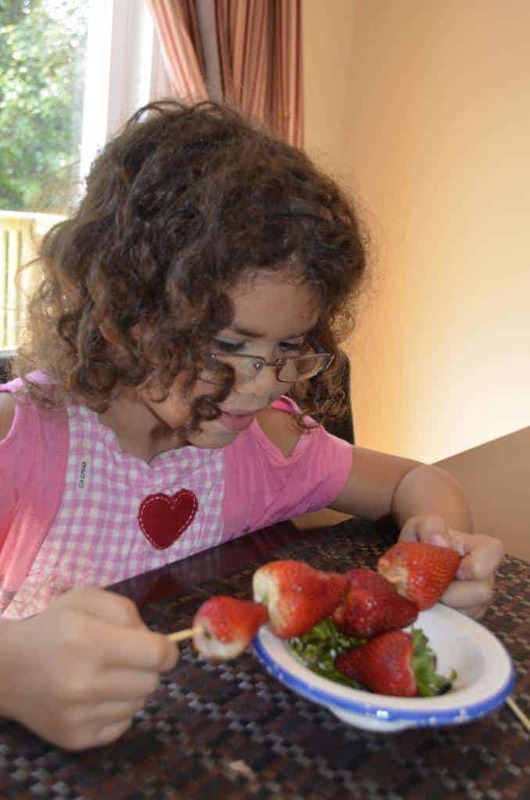 Looking for more great ways to get kids involved in cooking and come up with some amazing healthy snacks? Visit the Horizon Facebook page to grab a coupon and find more ideas! Check out Horizon on Twitter and Pinterest too! Thank you for the tips. Excellent ways to eat more healthy snacks! I am glad that your daughter loves to eat fruit. It is healthy for her. My summer babe loves to eat frutis as well especially apples and strawberries. By the way, your daughter is so pretty.